Hi Everyone! Hope your having a great weekend! Mine has been pretty good! Hubby and I went to breakfast on Sunday and it was fantastic! Sometime, I’ll have to take a picture of my meal, it’s amazing!!! After that we came home and did some work on my computer, while Hubby put the sprinkler system into my vegetable garden. Yah!!! Made a quick dinner on the grill, nothing fancy and than made this!!! 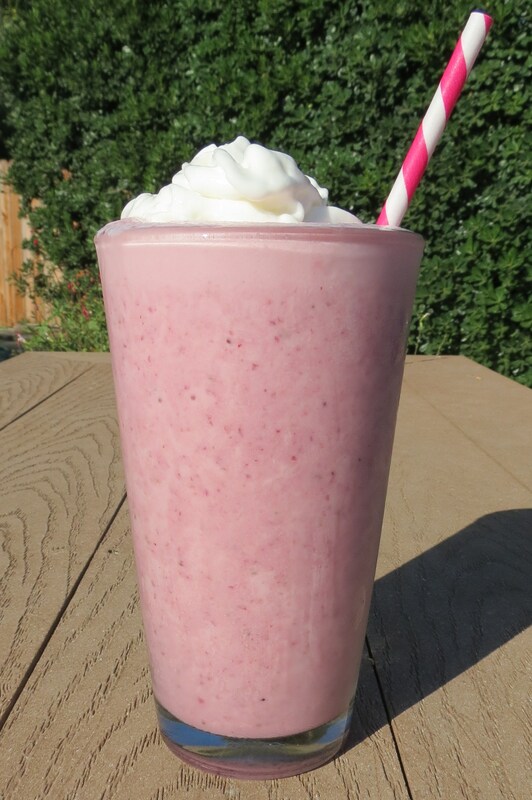 This is my Skinny version of a Strawberry Milkshake. It was heavenly!! It’s so creamy, sweet and full of bursting strawberry flavor. It was amazing! I felt like a kid drinking it. Want to know a secret? 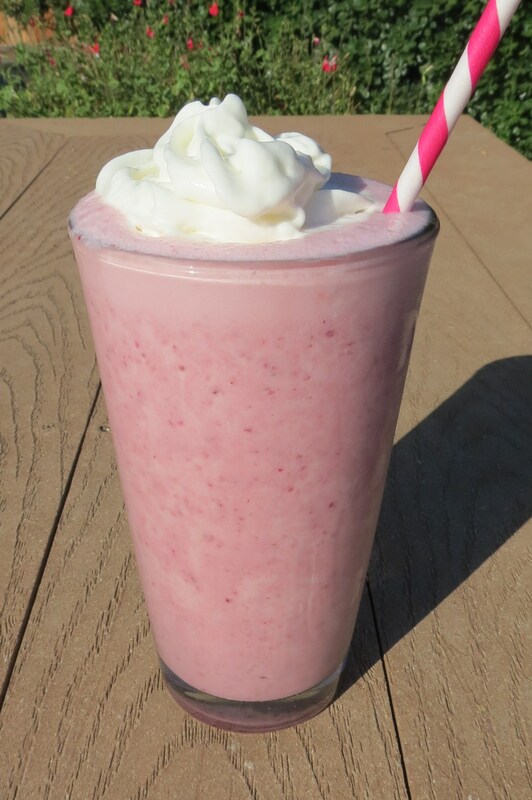 I never had a strawberry milkshake before, even as a kid. I always got vanilla or chocolate. I must of been some kind of weird kid or something? Anyway, I asked Hubby to take a sip and he didn’t want to, and I said come on, and than he did and he was like thats good, and it’s skinny? Of course dear, I try to cut back on calories wherever I can. I think he was pleasantly surprised. 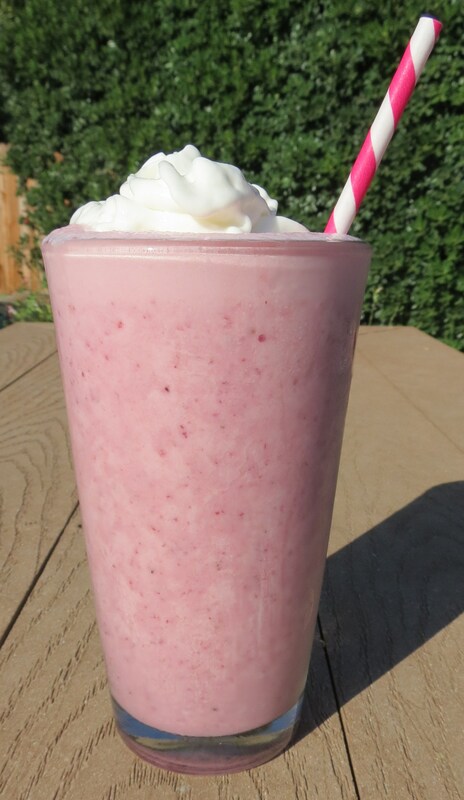 I made this bad boy with frozen strawberries, non-fat milk, a packet of Stevia and 1/3 cup of vanilla ice cream. Now I know I could of made it even skinnier by using something else besides real ice cream, but you know I bought it this week and had to use it. So be prepared for more ice cream recipes. I have half of a half gallon left, but that maybe gone sooner than expected, if I don’t stop spooning it in my mouth!! Just look at the frothy top. Looks like the Nestle Quick commercial with the rabbit. I’m kind of mad at myself! I cut up a pretty red strawberry to put on top, but once I tasted this milkshake I forgot about it. Besides it was flowing over the edges and I think the strawberry would of made it spill, and I couldn’t lose any of the shake. That would be a sin! Ok, I’m making excuses, I totally forgot. I hate when I do that! 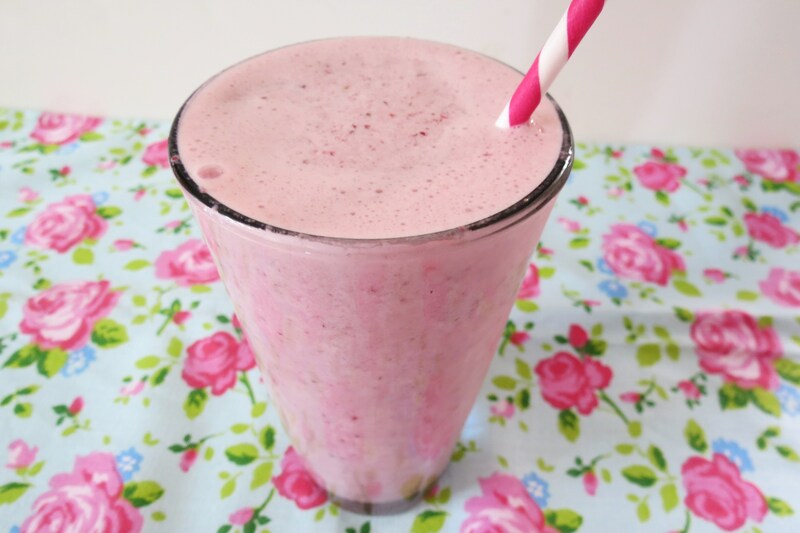 You have to try this milkshake, I promise you will love it!! Love it I tell ya!!! Muah!! 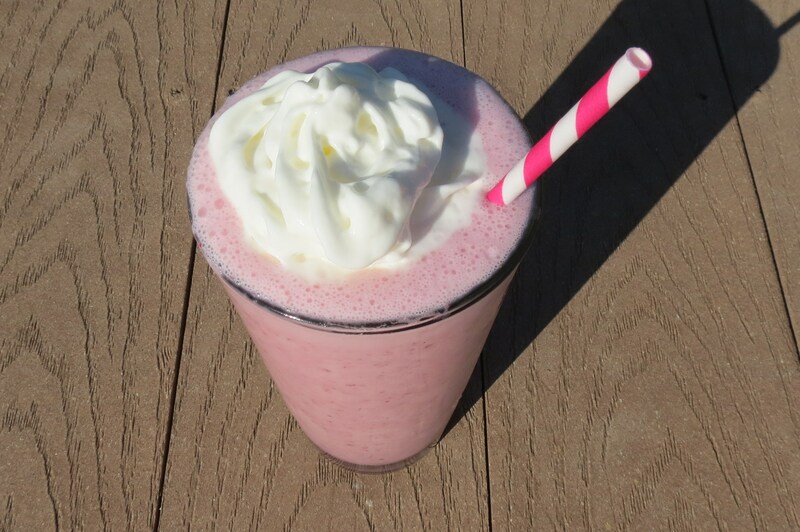 A sweet, creamy summertime strawberry milkshake made with strawberries, ice cream and milk. 1 packet of Stevia, about 2 tsp. 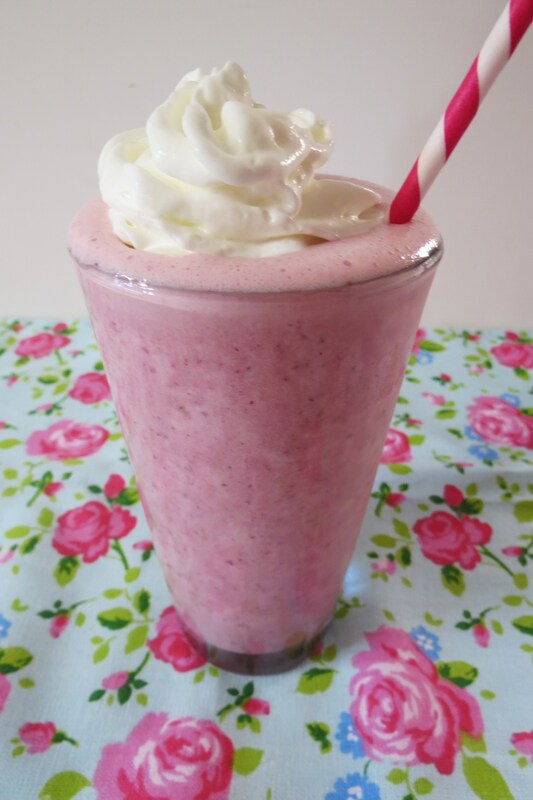 In a blender, puree the strawberries,milk and stevia together, than add ice cream and blend until incorporated. Serve with whip cream and a strawberry if desired! Now you know I like to do a comparison stat on these kind of treats. So I took the small strawberry milkshake from Dairy Queen for my comparisons. Wow! There’s is a small too, which my guess is 12oz. Mine is over 16oz!! Look at there Carbs and Sugar! See why I call mine skinny? So it’s Memorial Day, treat yourself and make a shake!!! Well my Friends, I’m taking off! I just wanted to share with you my tasty creation and wish you a wonderful Memorial Day!! I’ll be spending my Monday in the kitchen baking! Woohoo!! I haven’t done that in a long time!! See ya tomorrow! You’ve made all of my milkshake dreams come true with this! Hope you’re having an excellent memorial day! your pictures are gorgeous and this sounds AMAZING!! 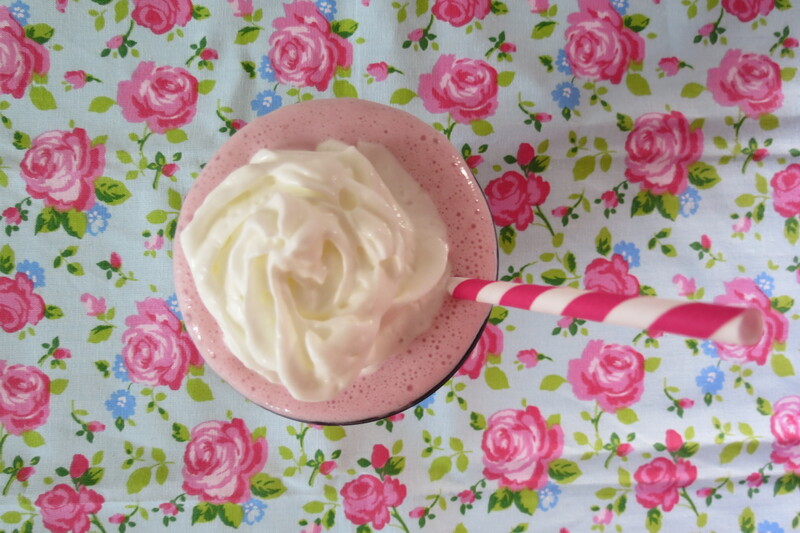 Now this is one amazing milkshake-a perfect drink to kick off Summer and the hot weather ahead! I agree and today it pretty warm out! Think I’ll make this again tonight!! Enjoy your day! I am enjoying my day! Just cooking up a storm!! I miss days like this! It is HOT up here in Toronto today and a milkshake like this would be the perfect treat to cool down. Looks delish! Wow, everytime I’ve been to Toronto it’s never hot and I usually go in the Summer. Such a beautiful city!! That looks sooooooo good!! However, I’ve been trying to find a milkshake I can make without using store bought ice cream. Perhaps you could create a receipt for that?? I have everything on hand for once so tomorrow I’ll be making this for sure!!! Hmmm, without ice cream? You could do frozen yogurt. Or maybe freeze coconut milk, scrape it every couple of hours, and when frozen, add it to your blender with milk and strawberries, 1/2 tsp. vanilla extract and some stevia for sweetness. I think that may work? The flavor would be rich creamy taste, with a bit of coconut flavor, but the texture maybe a little different. However I think it would taste good!! I’d say try that, I haven’t so I’m not sure, but I bet it would work! Looks like a very refreshing drink! I go so go one right now too.